February activations (excluding training) were 7, the same as the prior year. March to date has seen 11 activations (including 3 in one day and 6 within a 4 day period) compared to 4 for the whole month last year. Abell Point Marina VMR1 has just completed its 14th medivac for the year to date, compared to 33 for the whole of 2018. One of those recently was another double from Hamilton Island. See Activations for more detail. The Special General Meeting seeking the support of all active members to proceed to the evaluation and purchase phase for our second, smaller rescue vessel received over 75% endorsement, and a small sub-committee will proceed to phase 2, which involves consultation with active members, vessel selection, and recommending acquisition of a suitable vessel to the Management Committee. Most of the equipment for the AIS installations on Hayman and Mt Robinson has now arrived, and when the last two aerials arrive – hopefully next week – we will be able to go ahead with installation and commissioning, subject to cooperation of the weather gods for the helicopter access to both sites. The State Council meeting for VMRAQ was held on March 16 and 17, and gave an interesting insight into the bigger picture for the members from VMRW that attended as observers. A lot of the focus was naturally on the Blue Water Review, with a lot of positive comments and optimism as to the outcome. Alan organised a great BBQ on the Saturday evening for our guests, and was capably assisted by Aaron, Nicole, Tom, Carol, Jo and Shirley, without whom the event could not have run so smoothly. The Toga Party was very successful despite lower numbers attending than anticipated. 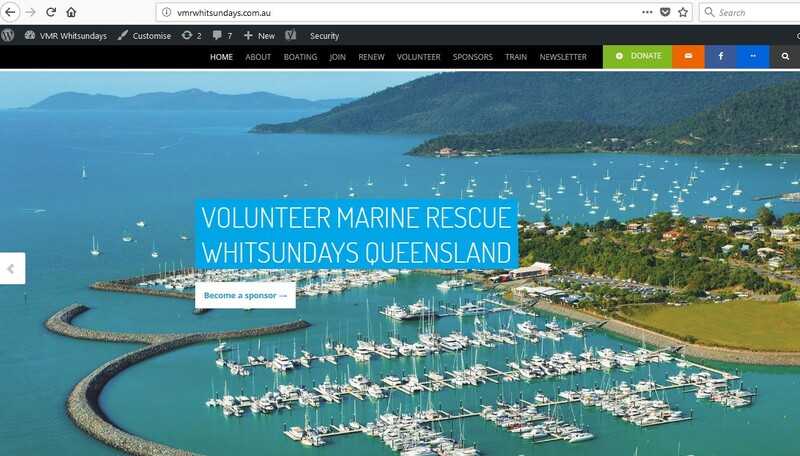 Thanks to the generosity of our many sponsors and the success of the online raffle and the other raffles and auctions on the night, VMR Whitsunday is more than $14,000 better off financially, a great result. Our sponsors got right behind us on this. Thanks must go to Alita from Whitsunday Escape for her invaluable assistance in setting up the very successful online raffle, and thanks also to Mark Beale and Paul Skinner from Ray Whites for their capable assistance running the raffle. We must also thank the small team of volunteers that put in their time and effort to make the event a success as without them it would not have happened. We must also acknowledge the people who gave up a Sunday morning to paint the wall decorations for the Toga party – Nicole and daughter Trinity, Heather, Ray, Ryan, Ron and Carol, and Alan. Thank you everyone! VMR Whitsunday is pleased to announce that Daydream Island Resort has joined the ranks of our bronze sponsors as the resort moves closer to reopening, and we are very happy to have them on board. The resort reopens on April 10th after a major refurbishment, and the details released to date show a stunning makeover. We wish them well for their reopening. Special Discount Offer for VMR Members! Our Platinum sponsors, Abell Point Marina, have generously offered to provide the following discount offer to ALL VMR members. To claim the offer, you need to show proof of VMR membership at the time of booking (your membership card). Oh, and you can’t use this in conjunction with any other offer. Not a member? You can join up here. **Proof of VMR membership to be produced at the time of booking. Not to be used in conjunction with any other offer. Offer valid until 31.12.19. Subject to berthing availability, a signed Berthing Licence Agreement and adequate vessel insurances. 1st Prize: 5 nights on a Seawind 1250 Sailing Catamaran (RRP: $5,750.00) was won by Judith Backway (Judith is a VMR Volunteer Radio Operator). 2nd Prize: 2 nights luxury accommodation at Peninsula Airlie Beach (RRP: $1,184.00) was won by Nina Puddicombe. 3rd Prize: 2 nights in a Deluxe Studio at BIG4 Adventure Whitsunday Resort (RRP: $350.00) was won by William Mayer. Beware the Ides of March…. What happened at the VMR Toga Party!?? The United States Coast Guard has sounded the alarm over the potential for light-emitting diode (LED) lighting on vessels to compromise reception on VHF frequencies used for radiotelephone, Digital Selective Calling and Automatic Identification System. These are commonly used for navigation lighting, searchlights and floodlights, as well as interior and exterior lighting—including those used for visual effect. Here is how to test for LED-lighting interference on your vessel, as well as what to do if you find you are experiencing the issue. It is very important that you DO NOT throw your EPIRB in the bin. Beacons can inadvertently activate if they are not correctly disposed of, which often occurs when beacons are thrown in the rubbish and end up in tips. Every year, thousands of dollars are spent in Australia searching for beacons in rubbish dumps. Search personnel and assets which are tasked to look for beacons that have been inadvertently activated are then unavailable for a real emergency. Beacon batteries are hazardous items which should be disposed of in an environmentally friendly way. In the local area, please note that the Cannonvale Transfer Station does NOT accept EPIRBs any more. Once deregistered and the battery removed, your expired EPIRB can be dropped off at AutoPro – 2/11 Shute Harbour Road, Cannonvale. AutoPro charge $5.00 to dispose of them correctly. When this is done, please also advise the Australia Maritime Safety Authority (AMSA) by updating your online registration account or by phoning 1800 406 406. We Have a New Silver Sponsor! VMR Whitsunday is pleased to announce that we have a new Silver Sponsor. Hamilton Island Enterprises have agreed to join the ranks of Silver Sponsors to support the operations of the marine rescue unit in the Whitsundays. Over the last calendar year, VMR Whitsunday carried out numerous medical evacuations from Hamilton Island, often at night and sometimes in inclement weather. Now is a good time to check your system—particularly if it’s an older one. This isn’t the first time a roll-over has occurred, so we know that most GPS devices will not be affected. The last rollover was in 1999. If you have an older GPS device then there is a chance that it may be impacted and not provide the correct time or position. Now is the time to do an update of the firmware, and check with the manufacturer to see if your GPS may be affected. More information at https://cyber.gov.au. Regular reef users, like commercial tourism operators and local residents may install privately owned moorings with a permit from the Great Barrier Reef Marine Park Authority and Queensland Parks and Wildlife Service. As part of responsible reef practices, reef users are encouraged to share moorings. If you wish to use someone’s mooring, this must be negotiated with the permittee — the mooring buoy, tackle and point of attachment to the sea-bed are the permittee’s private property. More information here. You’ll also find lots of information about public moorings here (PDF). How Well Do You Know Your Markers and Beacons? One of the above is a Cardinal marker, one is a safe water marker and one is an isolated danger marker. Do you know which is which? What about Directional and sector lights…or Leads….or Emergency wreck marking buoys? If you aren’t sure it is probably a good idea to update your knowledge at Navigation—buoys, marks and beacons. It has been a big month of relatively small amounts. When selling raffle tickets and at the “Toga” fundraiser, many people gave small donations or simply said “keep the change”. Our sincere thanks to all who donated. The same happened at our last sausage sizzle. Financial Member Tony Brooks was covered for a free tow but also donated $200 towards the fuel bill of his tow costs. Thank you Tony. Lance and Joan Mintram from Hydeaway Bay donate to VMR annually and handed a $50 donation to one of our Active members during the week. Thanks Lance and Joan. Then we have our faithful trio of Julie Roberts, Adrian Studt and Jeffrey Knight who have a standing donation every month. These guys are gold to us.🥇 If you would like to help us continue to make our waters a safer place, you may wish to join our trio and make a monthly donation. To do this, just go online to the Donations page on our website . Fill in the form and follow the instructions. When you are transferred to our secure payment page on Paypal, the amount of your immediate donation should be the amount you would like to contribute every month and click on ‘donate with a card’. This will take you to the credit card details page you will see a tick box ‘Make this a monthly donation’, immediately below the amount you wish to donate. Click on the box and complete the form and your credit card will be automatically charged each month. If you need to stop or suspend payments at any time, this is not a problem. Remember that all donations to VMR Whitsunday are Tax deductible. Our volunteers take some fabulous photos while they’re out on Abell Point Marina VMR1. This pic of VMR1 and crew against a beautiful sunset sky was taken by Murray Story while crewing for an activation on 17th March. Bunnings Sausage Sizzles – More to Come! VMR will be outside of Bunnings on Saturday, 6th April…..cooking up an absolute storm! HUGE thanks to Master Butcher’s who very generously donate sausages. While you’re adding events into your diary, write in the April Member’s Social Evening….which is on Monday, 1st April at 6:15pm. That’s April Fool’s Day but apart from the usual jokesters that frequent the VMR meetings,😋 it will just be a normal social get-together….and you’re welcome to attend. Bring your partner! That’s it for this month’s Samson Post…unless you haven’t read the Activations yet in which case, click on the link or the image below for all those details.